Hang on, two reviews? Of the same pub? That were both written on the same night by the same person? WTF, OMG and a whole load of other ROFL-tastic internet abbreviations! Isn’t that completely pointless? Probably, but then EU is not a stickler for tradition. In fact the only thing we stickle for is being utterly contrary. Jesus, if this potent blog was any more avant-garde, it would only be available in tenner bags. If we want to review the same pub twice we will, and to hell with all you haters. Besides, this double entry isn’t about sucking up to Carters, but rather about proving a point – that it’s possible to write about the same topic twice, without regurgitating the same content. It’s a simple enough objective, yet one that most tabloid journalists fail over the course of a single paragraph. That’s another rant for another time however. Morrison Street is one of those thoroughfares that seems to go on forever, although the reality is probably that your legs are just being lazy. Too narrow to accommodate the commuters trudging grimly to and from Haymarket, the street is virtually unnavigable at rush hour. When the pavements get too crammed to facilitate walking and texting, it’s probably a good time to abandon them altogether and jump into Carters. As excuses for drinking go, this one’s pretty lame, but since when in Scotland have we required extreme mitigating circumstances to justify going for an unreasonably early pint? It is hard to assess a bar’s sexuality – if a building can be deemed to have such a preference – on the basis of one visit. It may be the case that the cast from Ladyboys Of Bangkok have just stepped in, and that normally this place is a bastion of all things macho and heterosexual. Nevertheless, it’s hard to shake the feeling that anything goes in here, which is quite a nice feeling to have, albeit one that invites ample opportunities for the sort of misbehaviour that will be deeply regretted the next morning. On our return to Carters, DP and I were joined by two other companions, neither of whom, we soon learned, had seen Get Carter either. This begs the question: Has anyone actually seen this film, or is Get Carter just like The Human Centipede; one of those movies that everyone claims to have seen but no one actually has? On this occasion, we chose to sit in the the back alcove of the downstairs bar. 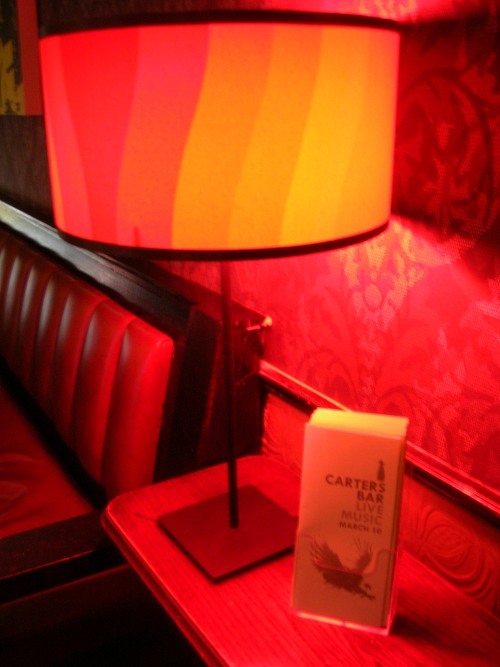 This cosy corner is replete with the sort of paintings that lend themselves to being surreptitiously stuffed into a man bag, or possibly ladyboy bag, in keeping with the bar’s ambiguous orientation. (Incidentally, there appears to be a gap in the market for transexual handbags, sized midway between a handbag and a man bag – if anyone wants to design them, we’ll take a 50% cut for conceiving the idea.) On the face of it, there seems to be a recurring theme developing in this blog of encouraging readers to pilfer pub trinkets. We should point out that we’re not actually condoning the theft of such furnishings, in the same manner that those who disseminate the Anarchist’s Cookbook online do so only for entertainment purposes – how were they to know that terrorists were gonna take them literally and actually try to blow stuff up? 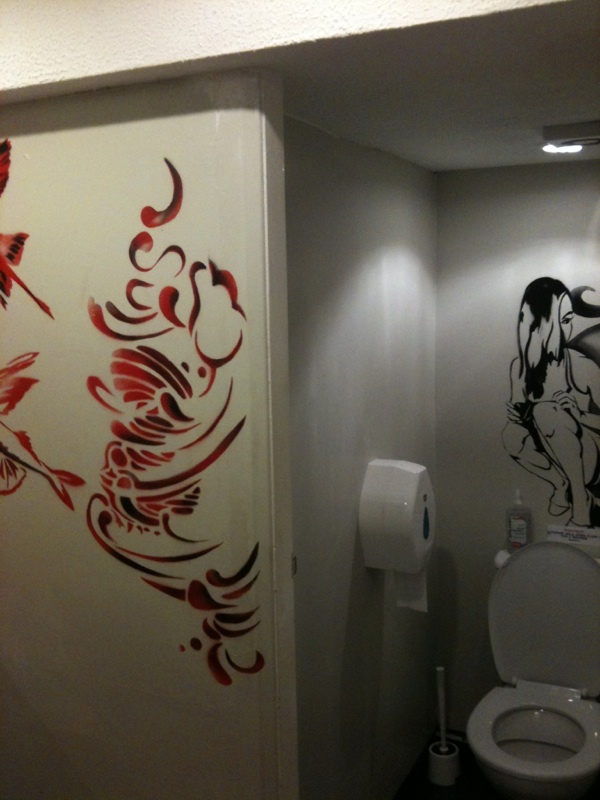 Although mentioned in the previous review, it is worth reiterating that the toilets in Carters are seriously funky. So much so in fact that this review wouldn’t be complete without a gratuitous picture of them. In fact make that several gratuitous pictures. 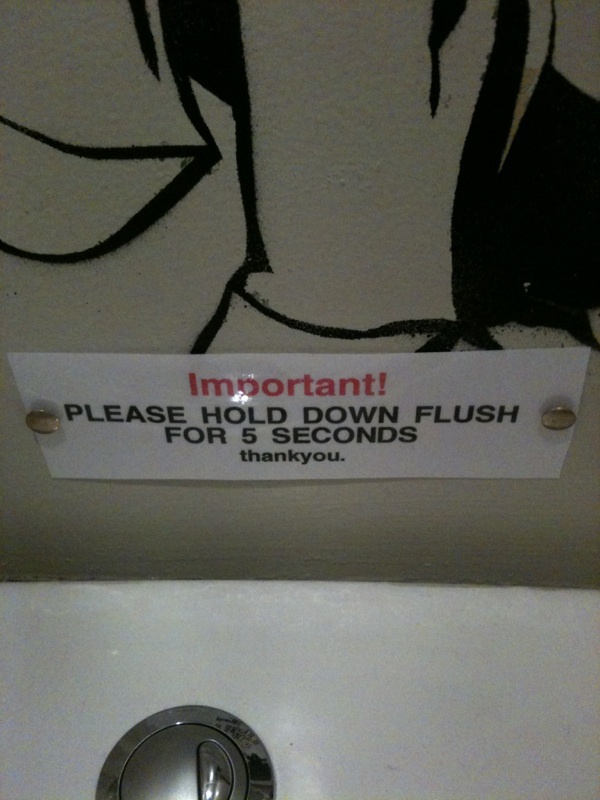 I don’t generally enclose photographic evidence of my bathroom exploits; George Michael made me sign a gagging order. Actually, that sounds wrong, doesn’t it? Let’s call it a confidentiality clause. 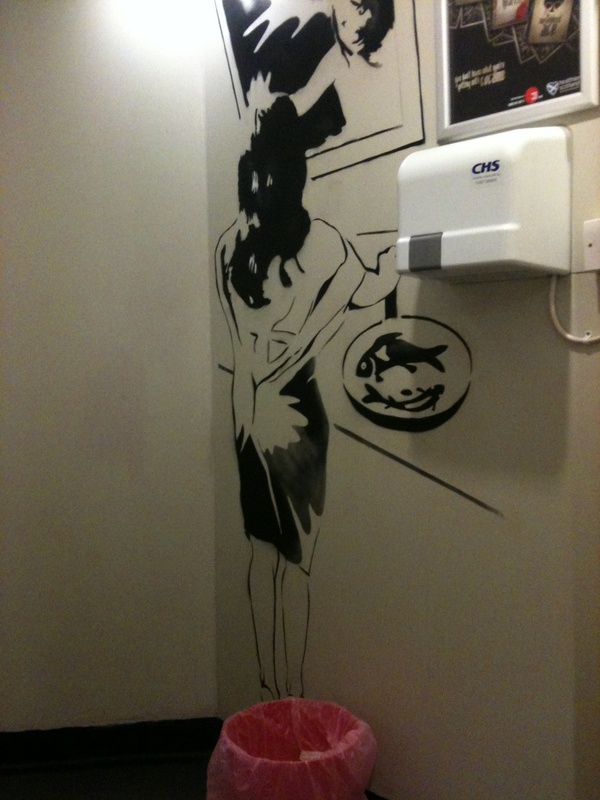 Anyway, the point is that the bogs in Carters Bar are so suave, they deserve their own Facebook appreciation page. 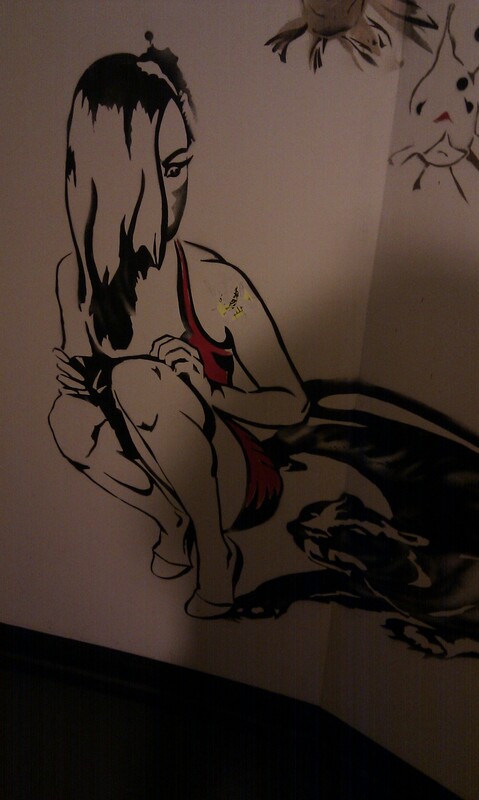 Even the graffiti’s top notch. If only the urinals were to dispense San Mig, there’d be no reason to ever leave this place. Try: Everything and everyone that takes your fancy in here. Avoid: Reviewing this place twice in a row, cos that would just be silly. Typical prices: The same as those cited in the Carters review that was posted a week ago, funnily enough. Inflation’s fast, but not quite that fast.